I can’t say I’ve ever given much thought to the topic of plaster in terms of interior and exterior finishes on homes, but I received an email a couple of days ago that piqued my interest. Leonard from Clay Interiors mentioned to me that lime plaster finishes naturally absorb carbon dioxide from the air causing the lime to return to its natural rock state over time. He also said that in Bermuda, most roof tops are coated in lime plaster due to the natural ability of lime to absorb impurities in rainwater. Len is a registered applicator in both lime and clay plasters. Len also pointed me to Vero, a manufacturer of lime plaster products, for further information. It appears that traditional lime plaster is more flexible than cement based rendering and as such is less prone to cracks (plus the cement industry is also incredibly carbon intensive). Lime breathes and dries out quickly, it is self healing to a degree, naturally mold resistant and easy to maintain. So what’s a “traditional” lime plaster? Lime plasters have been used for thousands of years and have been found intact in chambers of the pyramids dating back to 4,000 years ago. A traditional lime plaster contains lime, an aggregate such as sand, and water – and that’s about it; so it’s a little more environmentally friendly than some of the paints we splash on our walls. It’s the selection of aggregate that gives the plaster much of its texture and color. BuildingGreen says that modern plasters are often made from lime, cement, and sand and are improperly called lime plasters. 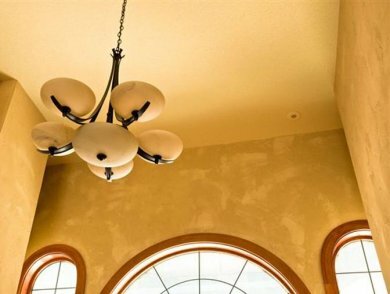 The correct name for these products is stucco, cement stucco or lime-based stucco. It seems the addition of cement to lime reduces its elasticity, breathability and durability. Vero says its genuine lime plasters are low VOC (Volatile Organic Compounds), have 28% lower carbon dioxide emissions associated with production than regular stucco and contain 50-65 percent post-industrial recycled content. The use of a real lime plaster can also qualify a project for LEED points under recycled content and innovation credits. LEED (Leadership in Energy and Environmental Design) is a USA-specific green building certification program; but similar programs in other countries may also offer a similar benefit. So there you have it, for your next rendering project, give some thought to using a genuine lime plaster. Just a word of warning – Lime is very caustic when wet but becomes pH-neutral when it returns to a carbonate state upon drying. When working with lime plaster, protective eyewear, gloves and suitable clothing should be worn.